LATEST - December 23 2016: The UK’s Chief Veterinary Officer has confirmed two wild birds in England have tested positive for H5N8 strain of Avian Influenza. “Today’s confirmed findings mean that avian flu has now been found in wild birds in widely separated parts of England, Wales and Scotland. “This is far from unexpected and reflects our risk assessments and the measures we have taken including introducing a housing order for poultry and a ban on gatherings. We’ll continue to work with ornithological groups to further strengthen surveillance and our understanding of the extent of infection in wild birds. “The risk to kept birds cannot be eliminated by housing alone. This virus can be carried into buildings on people and things to infect birds. Good biosecurity measures are essential. We also need people to continue to report findings of dead wild birds so that we can investigate". December 22 2016: The Chief Veterinary Officer for Wales has confirmed a finding of Highly Pathogenic Avian Influenza H5N8 in a wild duck in Llanelli, Carmarthenshire. Read more here. NFU chief poultry adviser Gary Ford said: “The Department for Environment, Food and Rural Affairs (Defra) has confirmed that Avian Influenza (AI) H5N8 has been identified in a commercial flock of turkeys near Louth, in Lincolnshire. “As part of the swift measures taken to contain and eradicate the disease, a 3km Protection Zone (PZ) and a wider 10km Surveillance Zone is in place, centred on the affected farm. This will have a significant impact on the farms within the zones because movements are restricted on and off farm. Are you in a zone? “The NFU remains in close dialogue with both Defra and the Animal and Plant Health Agency on this issue and we are working to support our members within this area. “It is worth reminding people that the risk to public health from the virus is very low and the Food Standards Agency has also made it clear that bird flu does not pose a food safety risk for people. Find the map and the full details of the zones in the Defra Zone declaration here. Dial 03000 200 301 to contact the APHA about movement licences, press option 1 for AI and then follow the instructions. Defra has brought in a temporary suspension on gatherings of birds at higher risk of avian flu across England, Scotland and Wales from 20 December. The ban on gatherings applies to birds at higher risk of avian flu, this includes the following, and restricts events such as livestock fairs, auctions and bird shows. Bird gatherings involving pigeons, aviary birds and certain other captive pet birds (strictly, columbiformes, passerines and psittaciformes) are only permitted (outside the Protection and Surveillance Zones) subject to strict general licence conditions (read more about the conditions of a general licence in England and Wales). APHA has made the following licence forms available. If you have any queries call APHA on 03000 200 301. General licences allow a movement or activity that would otherwise be prohibited. You need to check that you meet and comply with the conditions of the general licence. If you do so, you don’t need to apply - you can rely on the general licence as providing authority for the movement or activity. Specific licences must be applied for and obtained from APHA. If a licence is issued, it will allow a one-off movement and be subject to certain conditions based on disease control risk. If you have any queries then please contact APHA on 03000 200 301. There is no licence required for the collection of fallen stock, however, good biosecurity practices, such as cleansing and disinfection of vehicles on and off the premises, should be followed. Find out if your farm is in a zone on the Defra interactive map. Simply put your farm name into the box left of the map and click enter. Alternatively you can zoom into the map using the buttons at the bottom. If you’re in a zone then your holding will be in a blue (protection zone - PZ) or yellow (surveillance zone - SZ) part of the map. If you’re holding crosses the border between the two zones then the whole holding will be in the PZ. If you’re bordering the SZ and no zone then you’re holding will be in the SZ. What does being in a zone mean? Adhere to strict biosecurity on and off the farm. All premises within the PZ are also in the SZ. Poultry litter, manure or slurry should not be moved or spread. Anyone involved in the transport or marketing of poultry or poultry eggs must also make a record of those that are transported or marketed. Specifically for licence enquires please contact the APHA 03000 200 301. For concerns about the health status of your own flock please contact the vet or the APHA on 03000 200 301. 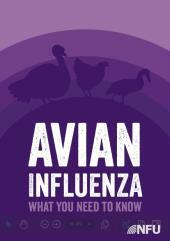 Download the NFU Avian Flu guide - the links producers might need when there is an AI outbreak and other useful information. You'll find a link to the guide, along with contingency planning and useful links here.